In a world where racism exists, we can’t ignore race. The US as a country has been forced to realize this through viral videos of the killing of black people, and the galvanizing power of the Black Lives Matter movement, which has become a global force. 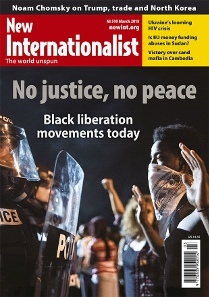 Black Lives Matter has become a rallying cry for a generation of black activists around the world, from the US to the UK, Australia to Brazil – as featured in this month’s The Big Story by Amy Hall, this edition's editor. As they build links across borders, one of the most empowering things about these struggles is that they make their blackness a source of strength, building on a long history of black resistance. There are so many stories to tell – many more than would fit in this magazine. Elsewhere, we explore other forms of resistance – including the bravery of an indigenous lawyer in Mexico, fighting to protect her community from oil companies; and, after five years, we revisit Mozambique where landowners are continuing to resist being bought out by foreign firms.